The Funny Farmers package includes: 1 Funny Farm Bounce House, 1 Funny Farm Inflatable Slide (WET) and a Cotton Candy Machine (supplies for 40 servings). Get ready for some good ol’ fun down on the funny farm! 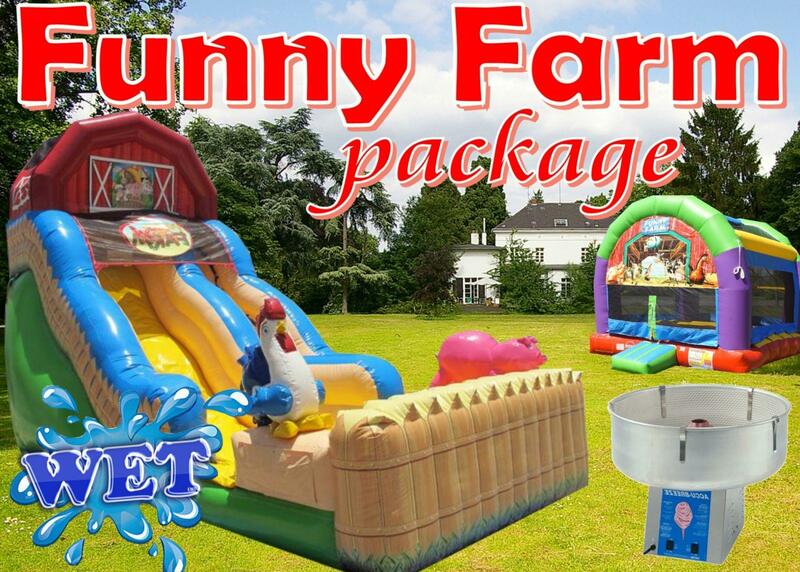 Your guests will go hog wild for the fun barnyard-themed Funny Farm Water Slide and Inflatable Bounce House. Want to see videos of the bounce house and inflatable slide on this package? When you rent this unit YOU MUST PROVIDE A HOSE LONG ENOUGH TO REACH WHERE THE INFLATABLE IS GOING TO BE SET UP.